This is generally the first question I hear when I talk with an ecommerce merchant that is considering our fulfillment house. And rightly so, as cost should of course be a consideration when evaluating order fulfillment companies. The challenge is….the type of fees can vary significantly from company to company. In this article, I’ll cover a few different fulfillment pricing models, as well as specific things that ecommerce merchants should be looking for when they’re planning to outsource their fulfillment and shipping. Trying to compare costs between multiple fulfillment companies can be like trying to compare apples with bulldozers. While some companies charge for everything under the sun, including packing sheets, dunnage, boxes, customer support, tech support, etc. (in addition to other general fees), other fulfillment centers only have a small handful of fees. This makes it difficult for potential clients to gauge which company will actually cost more. So how do you get a good apples-to-apples comparison? Provide the fulfillment company with a week or month’s worth of order data, and ask for a breakdown of all fees that’ll apply. Here’s an example…. – Average order weight = 2.2 lbs. Based on this type of order data, the fulfillment companies that you are considering should be able to come back with a monthly cost. If you have more detailed info, including a breakdown of international countries you’ve shipped to, that will help to make the quote more accurate. However, even with this basic info, the companies you’re evaluating should be able to give you a good estimate. When you do get the estimate, make sure the fulfillment company doesn’t simply provide you with one number. Instead, make sure to get a breakdown of all of the fees that will apply, including any fixed admin costs, support fees, technology fees, packaging fees, international surcharges, etc. Ideally what you want is to see a total cost per order, with all fees included, along with an overview of what goes into that cost per order. In fact, if you want to go a step further, try to get a sample invoice. I’ve talked with hundreds of ecommerce merchants, and on several occasions I’ve heard stories of those merchants not realizing that they were going to get hit with so many fees until they got the first invoice from their fulfillment company. When you get your estimate, make sure you’re clear that you want a breakdown of all costs that may or may not apply. This should include an overview of how the pricing will change if your order volume goes up or down. If you’d like, you could provide the fulfillment company with a few sets of order data, including actual data, as well as examples that show both growth and decline. The reason for this is that many companies discount their rates based on order volume. So as volume goes up, you should get a better rate. If volume happens to go down, including any seasonal lulls that happen throughout the year, your rates may go up. It’s also important to ask about minimums. For example, it’s common within the outsourced order fulfillment industry for companies to implement minimums, meaning their clients have to ship a minimum of 500 orders per month (or some other number). If they do not meet this minimum, there is some type of penalty. Other companies have long-term storage fees. What this means is that, if your product doesn’t move in and out of their warehouse fast enough, you are charged substantially more for storage. I have seen long-term storage fees that are more than $20 per cubic foot, so make sure you cover slow moving inventory with the fulfillment houses you’re considering. If you’re an ecommerce merchant that currently handles your own order fulfillment, one perceived attraction to outsourcing may be that you’d have fewer fixed costs. For example, you’d be able to cancel that lease on your warehouse. The issue, however, is that many fulfillment companies have high fixed monthly retainers. For example, you may need to pay a minimum of $1,000 each month, regardless of order volume or the level of service. Most ecommerce sellers experience some level of seasonality with their businesses, so as order volume ebbs and flows throughout the year, a high monthly retainer would mean that your per order fulfillment cost would go up and down throughout the year. Outsourcing your fulfillment can help your business in several ways, including freeing up time to focus on other things. If you can find a partner that also allows you to achieve more of a variable cost model…even better. Just like with any service provider, one other thing to be mindful of is the length of the contract, if there is one. What makes contracts generally appealing to the merchant is that they may be able to lock in a lower rate. The problem, of course, is what happens if the fulfillment company fails to meet expectations. If you’re considering a fulfillment center that is trying to lock you into a one-year or multi-year contract, try to negotiate the terms, including the penalty for breaking that contract. After all, dependable order fulfillment is critical for any online seller, so you need to make sure there’s a relatively easy “out” should things go south. Order fulfillment is not a commodity. Some companies do it well, others lack experience, technology, flexibility, response times, and/or other aspects that can result in a bad experience for the merchant and their end customers. So while price needs to be a consideration, it certainly should not be the only one. Here are some other things to consider with your fulfillment service provider…. One of the big benefits to outsourcing your order fulfillment is to free up your time. I talk with sellers nearly every day that tell me they outsourced their fulfillment and, to their surprise, really didn’t save any time. The reason? Technology…or lack thereof. Without the right technology, merchants will find themselves spending a lot of time manually placing orders, importing order files, trying to figure out what’s going on with their orders, retrieving tracking numbers, and the list goes on. It’s important to find a fulfillment partner that has the technology to automate the flow of order, tracking, and inventory data to make your life easy. This means having software that can communicate directly with your shopping cart(s) and any marketplaces you sell on. It means having ongoing access to a portal where you can maintain visibility over your orders and inventory. And it means having the flexibility to set up custom alerts so that you’re notified of certain situations, like when your stock gets low, when new stock is received, etc. Some ecommerce fulfillment companies are very rigid. They basically have a defined mold of the type of client they want, which may mean a certain product type, a certain SKU count, a certain order volume, etc. If you don’t fit in that mold, well, you’re unfortunately not a good fit. Flexibility isn’t only relevant to product type or order volume. It applies to other fulfillment processes as well, such as receiving, kitting, assembly, packaging, order prep, and shipping. If you have high order volume, small products, a low number of SKUs, and no special handling or warehousing requirements, you won’t have trouble finding a fulfillment house. For thousands of other ecommerce sellers, flexibility is critical. Do you have a dedicated account manager at your fulfillment company? Can you get someone on the phone if have an issue with an order? Is your account manager at the same location as the warehouse? If your order fulfillment pricing is extremely low, you may get a low level of service along with it. Additionally, it’s becoming more common within the industry for the fulfillment house to actually outsource the warehousing and order fulfillment to another company. Because of this, there is a lack of visibility and control, customer support staff may be at a different site, and all of this results in errors, delays, and inconsistencies. Order fulfillment is a big deal. And when you receive a high level of service from your fulfillment company, and when your support team is just steps from the warehouse, you’ll notice it. This one probably seems fairly obvious. When evaluating fulfillment centers, make sure to look into their track record and reputation. And not just what the fulfillment company’s telling you. My focus of this section is that order fulfillment is not a commodity. And it isn’t. Make sure to do your homework. Browse through forums, look at review websites, ask your vendors and peers. After all, some companies do it much better than others, and it’s not easy switching fulfillment houses. Ecommerce has really taken off the past few years. As such, there are a lot of companies out there that are looking to jump on the bandwagon, which includes order fulfillment companies. To attract new business, many of these companies low-ball their pricing. These are companies that don’t have the means to sacrifice profitability in order to gain marketshare, and it can quickly catch up to them. On about a dozen different occasions, I have spoken with ecommerce sellers that are in a tough predicament because their fulfillment company is going out of business. As you evaluate service providers, make sure to look at how long the company has been in business, and what their financial stability looks like. 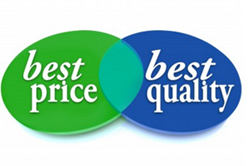 The pricing may look great, but that may not necessarily be a good thing. It’s not easy finding an ecommerce fulfillment partner. When it comes to pricing, they all charge a bit differently. So to help with your evaluations, provide prospective partners with data that will help to give you more of an apples-to-apples comparison. No matter what service you’re evaluating, and no matter how big or small your business is, price is important. But order fulfillment most certainly should not be viewed as a commodity. Some companies do it well, others do not. As an ecommerce seller, you fight hard to win every customer, and you need dependable partners in your corner that are going to make sure that fight wasn’t for naught. Order fulfillment companies all have different pricing models. Learn how to better evaluate service providers, and things to look for beyond cost.